Tan (seated left) and Ngeng (seated, centre) pose for a group photo after the press conference. KUCHING: A new international school, Borneo International School, will be opening its doors this June at Tabuan Laru here to cater to the educational needs of the community. Founded as part of a group of international and private schools with a track record of over 15 years in running high-performing schools in Peninsular Malaysia, Borneo International School will feature a co-educational system and emulate the salient features of the British education system. Students will receive an international education qualification via Cambridge University International Examinations, for which the school in an accredited examination centre. Such credentials are recognised worldwide for entrance into university and other forms of tertiary education. “We follow the UK curriculum which is used in over 160 countries. Once they are in final year, A-Level, the students can apply for UK, US or Australian universities,” said United International School director Mark Tan at a press conference yesterday. The seventh school in Malaysia and first in Sarawak, it is the first to have not one, but two swimming pools, one for beginner and the other for advanced swimmers. arts, music, drama and design, indoor badminton courts and outdoor tennis, basketball, volleyball and futsal grounds. He added that the fees are competitive, and there are four terms a year, from Jan to Nov for Primary 1 to Form 5. Schooling hours are from 8am to 3pm for primary, and 8am to 3.30pm for secondary. Aside from that, there are two days for co-curricular activities, held one hour after schooling hours. There is one day for sports and a different day for clubs and societies, he said. “There is no activity on weekends because we believe that weekends should be spent with the family,” he said. 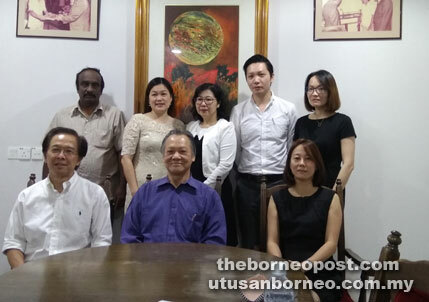 Meanwhile, Borneo International School director and Board of Governor member, Dato Ngeng Eng Cheng said its global accreditations and educational network brings quality international education right to the doorstep of the local community here. He added that it is easily accessible, 4km from Kuching International Airport and 7-8km from Kuching city centre, which helps to ensure that educational offerings are well within reach of an international audience. “This geographical advantage affords us the unique ability to support Malaysia’s aim to become the educational hub of the region,” said Ngeng. Borneo International School is associated with a group of international and private schools in Malaysia which includes Nobel International, United International, Havil International and Legacy School.